Ideas are the currency of the twenty-first century. In order to succeed, you need to be able to sell your ideas persuasively. This ability is the single greatest skill that will help you accomplish your dreams. TED Talks have redefined the elements of a successful presentation and become the gold standard for public speaking. TED—which stands for technology, entertainment, and design—brings together the world's leading thinkers. These are the presentations that set the world on fire, and the techniques that top TED speakers use will make any presentation more dynamic, fire up any team, and give anyone the confidence to overcome their fear of public speaking. CARMINE GALLO, bestselling author of The Presentation Secrets of Steve Jobs, is the communications coach for the world’s most admired brands. 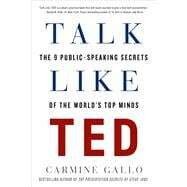 A former anchor and correspondent for CNN and CBS, Gallo is a popular keynote speaker who has worked with executives at Intel, Cisco, Chevron, Hewlett-Packard, Coca-Cola, Pfizer, and many others and writes the Forbes.com column "My Communications Coach." He lives in Pleasanton, California, with his wife and two daughters.